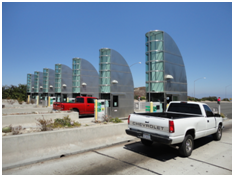 The customer required a display for unmanned, outdoor toll collection gates. Users pay with exact change at automatic coin machines. They spec'd an unusually thick piece of vandal proof polycarbonate sheet. The display also needed to be high bright, vibration resistant and sealed to protect from weather and road dirt. An unusually thick piece of glass is too heavy for standard optical bonding. IEE needed to find just the right adhesive formulation and cure cycle-time to properly adhere the glass. Some of the issues they faced using the polycarbonate sheet included “out-gassing” and UV light blockage, both of which inhibit cure time. IEE designed a 15-inch display with custom brackets to support the heavier unit and selected a vandal proof Lexan polycarbonate sheet. They created their own bonding solution using the proper DuPont™ Vertak® adhesive, compatible with the materials being used and the associated cure process, which was now 30% more time. IEE also created custom optical bonding to provide sunlight readability and added both heating and cooling units to adjust the operating temperature.